WASHINGTON, DC – Today, AARP Travel released the results of its annual travel trend survey, examining travel behaviors, expectations and planning among Baby Boomers, Gen Xers, and Millennials. According to the research, Boomers are eager to travel in 2019, planning to take a total of four to five leisure trips, on which they will spend over $6,600. Travel planning is taking place earlier as compared to years past. A significant majority of Boomers (88 percent) planning domestic travel in 2019 have already selected their destination, an increase from 72 percent of 2018 domestic travelers. For Boomers traveling abroad, 31 percent have booked their 2019 trips by September 2018, up from 23 percent by September of the previous year in 2018 and 17 percent in 2017. Forty-seven percent expect to only travel domestically, 48 percent hope to travel both domestically and internationally and 6 percent will travel abroad only. 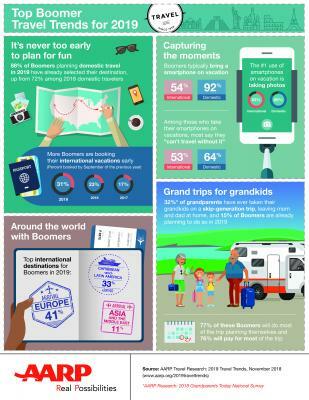 Thirty-two percent* of grandparents have ever taken their grandkids on a skip-generation trip, leaving mom and dad at home, and 15 percent of Boomers are already planning to do so in 2019. Seventy-seven percent of these Boomers will do most of the trip planning themselves and 76 percent will pay for most of the trip. AARP Travel, a valuable resource for Americans 50-plus, who spend over $125 billion annually in leisure travel, helps travelers stretch their dollar and itineraries while also stretching their minds and possibilities. AARP Travel provides all interested travelers with vacation ideas, tips and inspiration for their next getaway. For more information travel tips, vacation ideas and destinations visit: https://www.aarp.org/travel.